Having built an eco-house myself I thought I had a basic grasp of how an eco-building works and why. However, I have since realised that I had only just begun to understand the principles of eco-building and how they work with each other. Two weeks ago I attended a training course run by Brighton Permaculture Association on ‘An Introduction to Self-Building an Earthship’. I went to learn more about the principles of Earthships – buildings made from walls of tyres rammed full of earth. However, I learnt a whole deal more and thoroughly enjoyed myself at the same time. For anyone remotely interested in eco-building, whether an Earthship or not, I would recommend this course. It was informative, pitched at a high level but explained in plain English, had a great mix of talks and practicals, and was taught by a highly knowledgeable group of staff who seemed able to answer any of the random questions we threw at them. 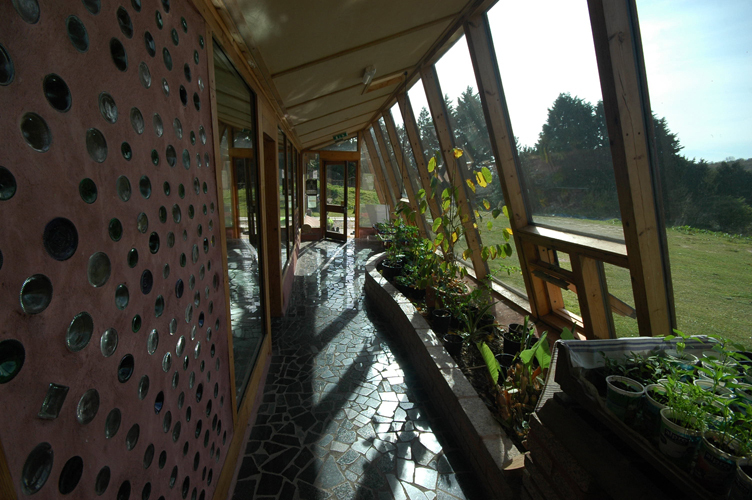 What is more it was set in the beautiful and inspiring Brighton Earthship in Stanmer Park – providing an opportunity to see in practice how the theory was actually working, which helped considerably when understanding, for example, the importance of underfloor insulation in Britain. The course covered all the components that you need to understand in order to legally build an eco-house in Britain: Building Regulations, planning, building physics, building materials, climate and location, building performance, renewable energy systems, water and sewage systems, lighting, and finances. The 5 principles of Earthships are: (1) to build an off-grid house with its own power generation; (2) water harvesting, storage and treatment are all on site; (3) that the building is heated and cooled without the use of fuel; (4) in home food production; and (5) building with recycled materials. Building Regulations were often identified as a barrier to be negotiated in green building, and are perceived as a complicated set of regulations which few understand – which in itself restricts eco-builders ability to navigate them. Other legislative barriers include The Environment Agency who currently consider tyres a toxic waste and as a result prevent further building using them in Britain. That understand and using building physics is crucial for effective eco-house design and that effective use of such principles is reliant upon a detailed understanding of the surrounding climate environment. 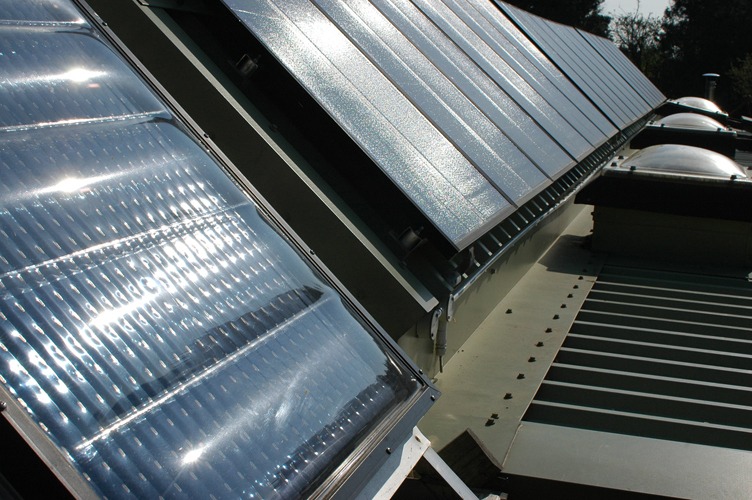 Thus it is necessary to know about wind direction and solar radiation in order to design an appropriate house. Understanding the interlinked nature of building physics, however, also raises a tension between the need to use experts in an eco-build and how the use of such experts increases costs and shifts any build away from being of a self-build ethos. We have to understand location and the issues of that location in order to build effectively. For example, in general Britain is a damp country, our houses need good insulation and heat, but we tend to have plenty of water. An Earthship has food production as core to its design. It uses greywater planters inside to create an all-year growing season and be being inside and thus warmer it is possible to grow a broader range of fruits. This extends the remit of what a house should ‘do’ – it is not just about shelter and comfort, but food too. In order to make a house more affordable we need to: change the materials we use, scale up (benefit from economies of scale), share infrastructure, and build closer together (increase density). Planning is still perceived as a major barrier to innovative eco-building – that essentially planning in Britain is traditional in its approach – which has pushed many experimental eco-builders abroad. That we need to constantly adapt and evolve eco-house design and learn from the successes and failures of previous builds. We should not adopt a blueprint, like that of Earthships designed in New Mexico, and simply import the idea without altering it to suit our climate. Finally, there is a lack of knowledge about how eco-buildings actually perform. Too often there is an approach whereby we (1) do not talk about the failure of our green buildings, (2) we do not measure the performance of our buildings, and (3) we take claims about the performance of buildings at face value. We need independent assessments of how our buildings are actually working. 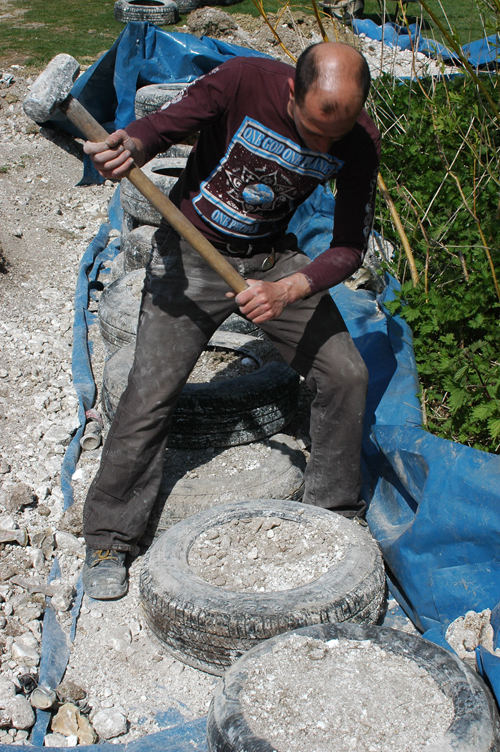 One of the practicals during the course was to start to build a wall using tyres and ramming earth into them. Once you have chosen a selection of same size tyres (185 depth is ideal, with over 60 tread width) you line them up and shovel in earth. Using a mallet this earth is then rammed into the tyre. This process is repeated until the tyre is completely hard and feels solid throughout. The second layer of tyres is then put in, using cardboard to line the bottom of the tyre, and setting back the tyres an inch from the bottom row (so the wall effectively leans back slightly). Once you have the size of wall you want you can finish in off with a cob in-fill and a lime render to provide a smooth finish. 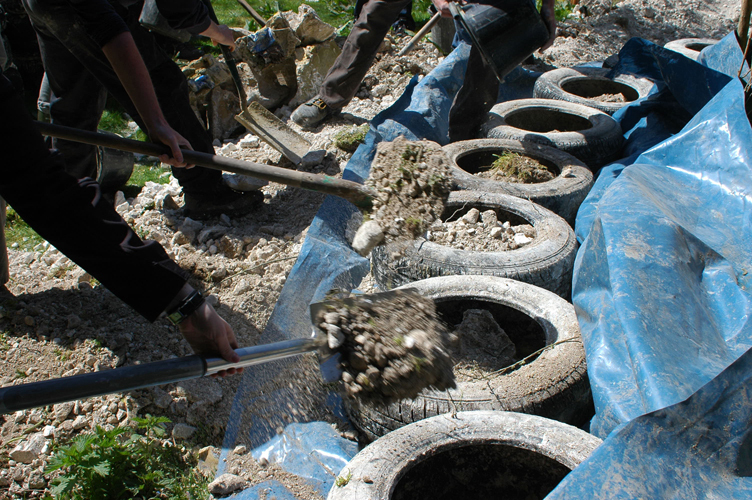 More information on how to build a tyre wall: http://www.sustainablebuildingresource.co.uk/wiki/index.php/New_build:earthship:_tyre_ramming. For a non-load bearing wall (i.e. a wall that does not support any significant structure and weight of your building) a wall made from recycled glass bottles adds a colourful addition. 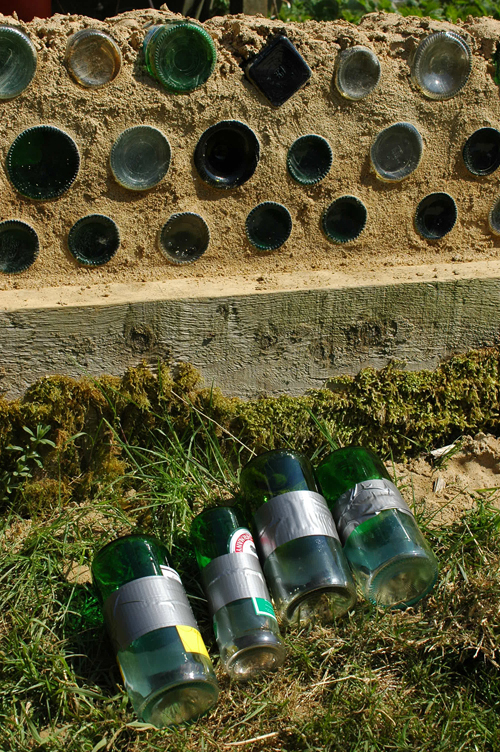 We made one using a wet tile cutter to slice the bottles. Using two similar sized bottles you tape them together using duck-tape, then using cement and sand layered them to build the wall. It should be constructed in a ‘honeycomb’ pattern to give it strength with a minimum of 1.5 inches of mortar around each glass brick. Then you use a sponge and water to wipe off any excess mortar. Using this method you can only do a few courses a day as you need to allow the mortar to dry in-between. For more information on building a glass bottle brick wall see: http://en.wikipedia.org/wiki/Bottle_wall. 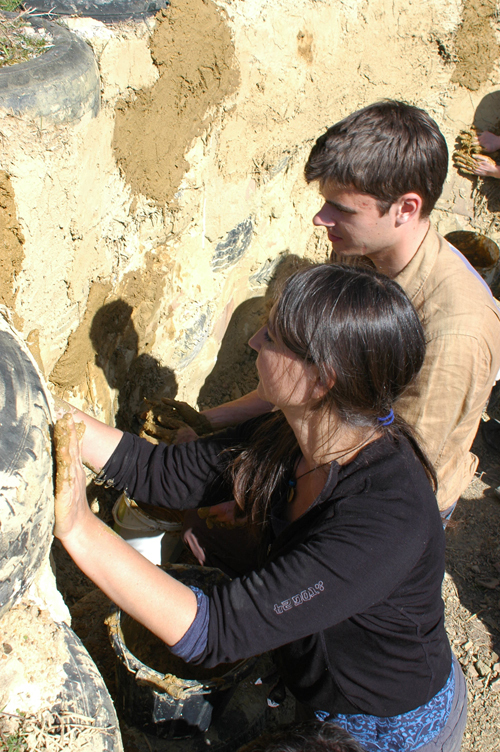 Paulina Wojciechowska (Earth Hands and Houses) taught us how to plaster a wall using clay. 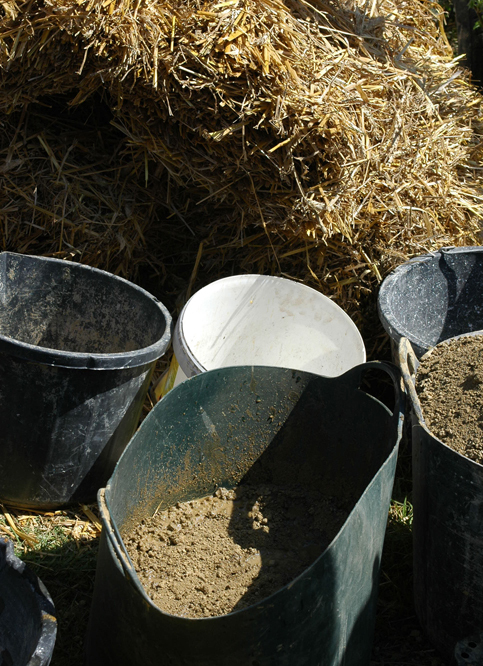 Using just clay, sand, straw and water we were able to create a variety of different textures over a rammed tyre wall. 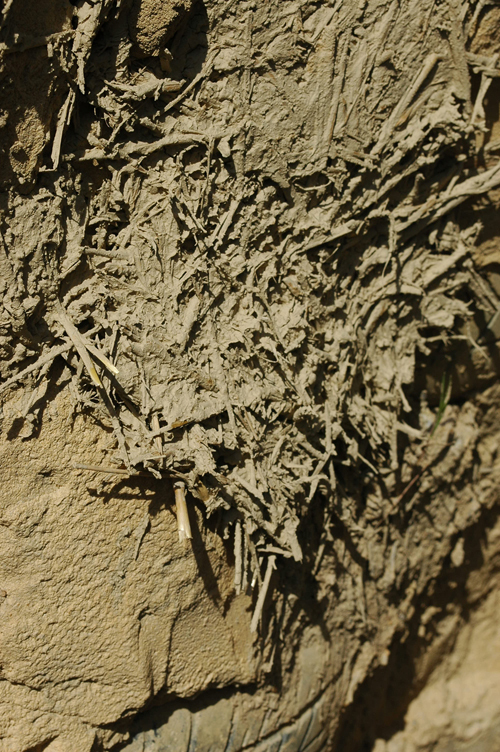 We created a base layer, which was thicker and gave a rougher finish, out of straw simply rubbed and covered in wet clay. 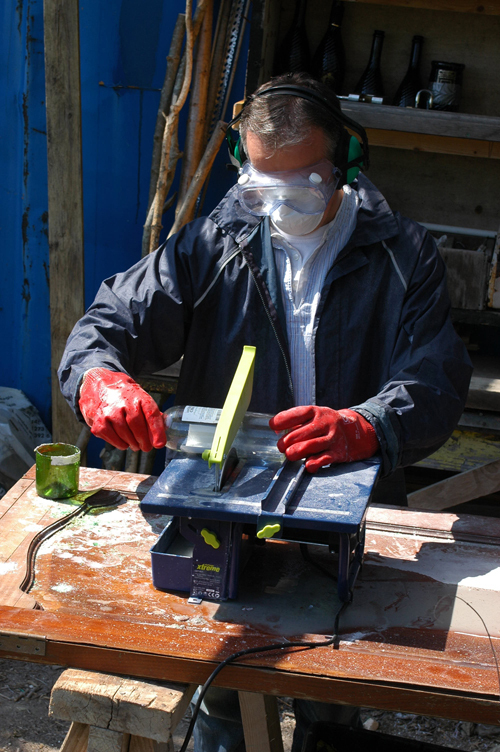 This produced a very sticky material which you can sculpture. For the top layer we used sand and you would also use wheat paste at this stage to improve the resilience of the plaster. At this stage you can use a trowel to create a smooth texture. A great and easy way to make a plaster using local resources. Natural and more traditional construction has to be the way forward. I love earthships, but for more traditional looking buildings cob is a great building materials. I am also a huge fan of strraw bale construction. All low skill, envionmentally friendly and using these materials seems to instantly lend character to a building. I struggle to understand why bricks and mortar still rule. I am completely and utterly in love with this, thankyou!! I love this idea of earthship. This seems to be a great way to reduce the foot print and become Eco-friendly in comfort. Living off grid for the last 6 years and learning from the experience. Lived in a garage size studio, placed back into the hill side. Using the natural flow of the air coming down the hill for cooling. One step at a time for us, first to pay off the land then to build a sustainable home. Do you therefore have any suggestions to suitable alternatives to used tyres, or has the EA relaxed its stance since this article was written? 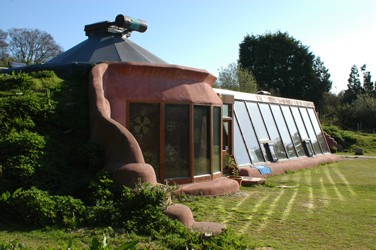 I am not up on the current EA position on using tyres, but Earthship Biotecture have developed models using straw bale, concrete, or adobe (http://earthship.com/packaged-model), so it is possible to use the principle of a highly thermal design built into the ground at the back, using different materials.